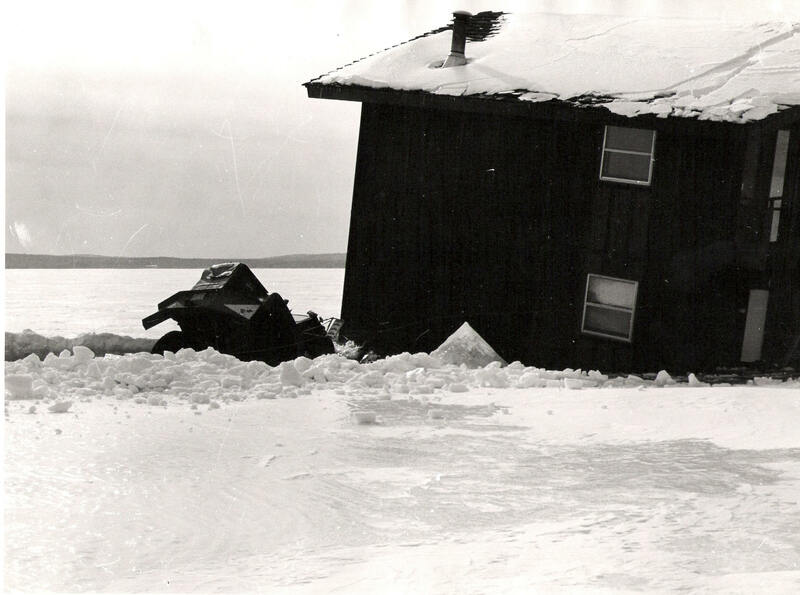 The story of the house that fell through the ice of Lake Superior off the shores of Madeline Island brought comic relief to the cold winter of 1977. After a January when temperatures in Chequamegon Bay rarely rose above zero the idea that moving a 30-ton truck from Port Superior to LaPointe, Wisconsin almost made sense. Almost. The seven-room, fully furnished house only made three of the four miles to Madeline March 2. 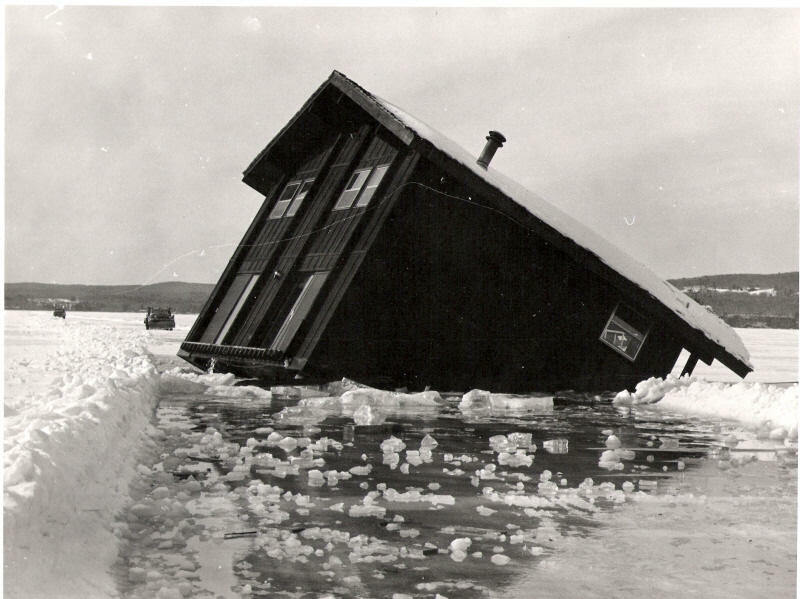 The truck broke through the ice and eventually pulled the vacation home to the bottom of Lake Superior. The story made international news. It came less than two years after the Edmund Fitzgerald went down and only five months after Gordon Lightfoot’s song “The Wreck of the Edmund Fitzgerald reached No. 2 on the Billboard charts. The picture of the house sitting crooked in the broken ice ran from Miami to Tel Aviv. The Los Angeles Times ran it on the front page. Like all good news stories it stayed around for an encore. The Coast Guard ordered the owners to remove it in the spring from its 90-foot deep resting place. 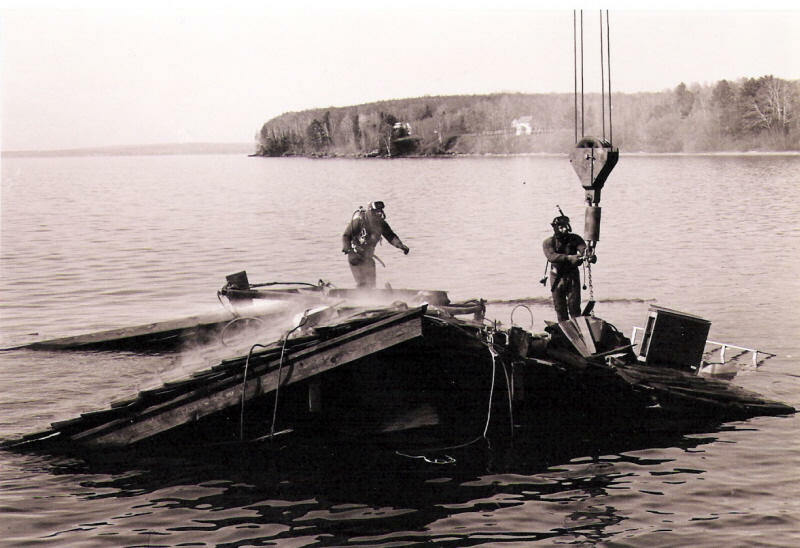 Divers worked with Ed Erickson, owner and skipper of the scow Outer Island to lift it to the surface in May. Then the bottom fell out. All that was left at the end were pieces on a dock and a waterlogged truck. Duluth and Minneapolis media were on hand. Headlines spread across the wire services. Like the Edmund Fitzgerald, the house story had its own song, “It Sunk,” written by Washburn cop and folksinger Tim Chaney, now of Hayward. He and Phil Anich of Washburn sang the song regularly through the 1980s and 1990s in clubs around the bay and at the Ashland Folk Festival at Northland. “I heard about the house through the song,” said Tom Martin Erickson, host of Wisconsin Public Radio’s Simply Folk. I was a reporter for the Washburn-Bayfield County Times then. They were moving the house on a Wednesday, the day we went to press. I covered the event in my 1965 Volkswagen bug, driving nearly a mile out from LaPointe to wait for the truck to come. The house tilted off the driver’s side and looked like it fell off the trailer. I drove up and found the late Lyle Rhine, the driver warming his hands. The truck was still running and in gear. 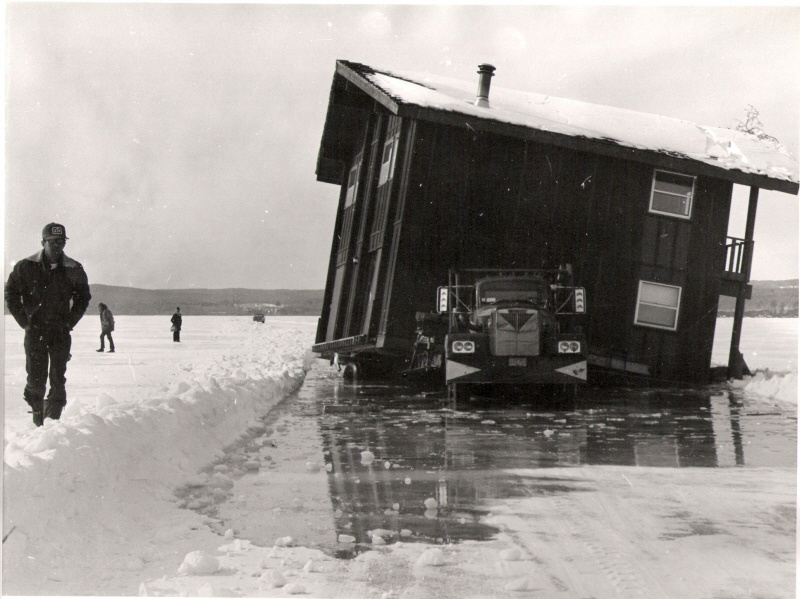 Moments later, the ice cracked and the timber of the house moaned as the truck sank with a gurgle from its exhaust pipe. 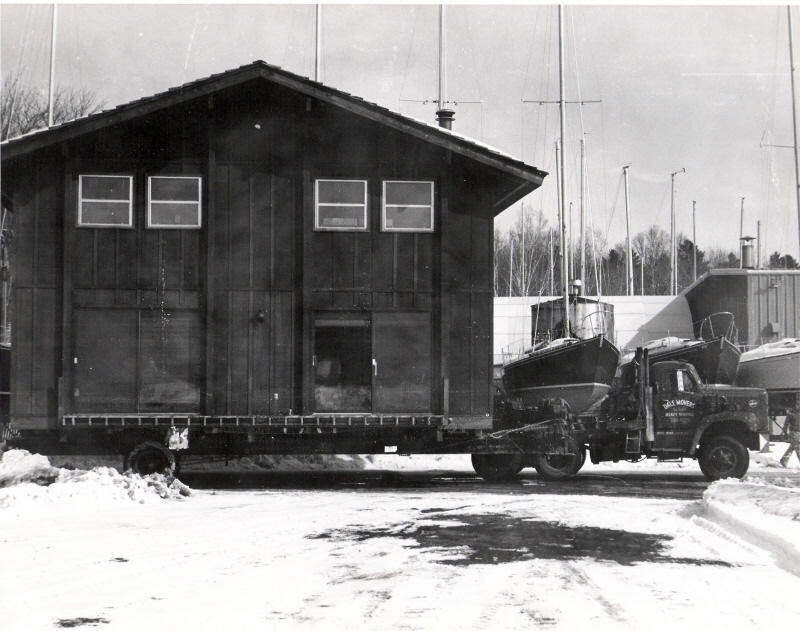 Lyle Rhine of Dale Movers, a Minneapolis company drives through the Port Superior Marina on March 2, 1977 with a house he was carrying across the ice to Madeline Island. “I wouldn’t try it if I didn’t think I could make it,” Rhine said. Harvey Nourse of Bayfield, who knew Lake Superior well, rode along. About three quarters of the way across the road plowed just for the moving trip the tires of the trailer broke through the ice and with the truck still running and in gear Rhine poses. “Rocky you’ve got your story,” he said. I walked around the house and was standing on the west side when my partner yelled that the truck was sinking. I clicked my shutter just at the moment it went under. In May, divers worked with Ed Erickson, owner of the LCT Outer Island to lift the house from the bottom 90 feet down. They successfully brought the waterlogged house to the surface but the bottom fell out. They did recover the truck. He came through the forest and he had a song to sing. About concrete walls and neon halls and place to sit and eat. He told of the story of a land that he would build. With flashing lights and city folks and fountains that he drilled. Then he planned to bring some boats from ports near and wide. Yes Canada would bring her boats to the pride of our side. And when the first boat entered into his harbor deep and wide. The captain yelled across the horn he had no place to hide. And then he planned to take his toys across the distance shore. And no one ever thought that they would see his house no more. Yes the timber cracked and the men were crying and there was a mighty sound. As the house they drug across the ice went slowly down and down. He came through the forest and he had no song to sing. Just broken promises to folks and other things he dreamed. And now the story’s over and the man he sits alone. There was a washer and a dryer and chair and a couch. He never had a chance to take it all out. It had glass sliding doors and thermal window panes. A trough for the gutters for even when it rains. There were pictures on the walls and carpet in the halls. Blankets on the beds and showers in the heads.